There was a power outage last week here in the American Southwest. You might have seen it in the news – or even been affected yourself – it was quite a large blackout, about 5 million people without power. It was interesting to go for the evening walk with the dog, seeing house after house darkened, and the unusual sight of neighbors actually talking with each other on the street. Amazing, the things that happen when the TV and computer are out. As always, it brought home to me how lucky we are to have such things as electricity at our constant disposal. With a changing world on my mind, it was a thoughtful but enjoyable walk. First, the equipment. You’ll need, not surprisingly, a candle. But not just any candle: this needs to be a natural beeswax candle, not the paraffin or carnauba wax variety. Preferably, it will be a beeswax candle with no perfumes or dyes. You’ll need some kind of metal bowl capable of holding water, and some way to hang it suspended above the candle while the candle is lit. It doesn’t have to be fancy; you can see the system I’ve jury-rigged here. In fact you can tell a lot about me and the kind of stuff laying around my household from taking a look at the different objects I’ve used here: two fantastic books from the DeYoung Museum in San Francisco about impressionism and post-impressionism; an old paintbrush holding up the bowl; a sketchbook to adjust the height of the candle (notice how the cover is bound upside down–I saw it that way on the shelf and of course had to grab it); and the table underneath protected by a newspaper clipping about the power outage, which I just had to put under the candle. 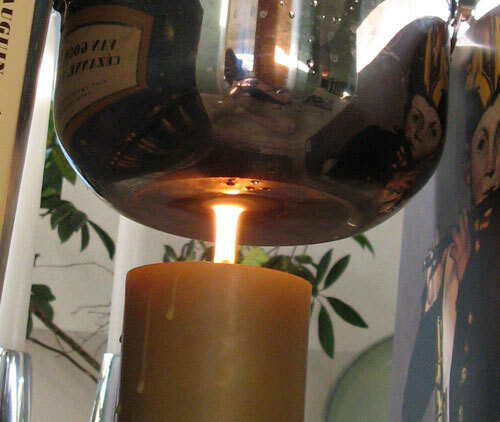 Fill the bowl with cold water, suspend it, then light the candle and put it under the bowl. The candle flame will deposit its black soot on the underside of the bowl. This is your pigment. You can see in the pic how close the candle should be to the bowl. This will heat the bowl up quite a bit, more than one might think, and that’s why it’s necessary to fill the bowl up with cold water before beginning. One of the great things about making candle black is that it’s not labor-intensive at all. You can walk away and do something else while you’re making your pigment. Just wander back once in a while and put a finger into the water to make sure it’s not getting too hot. 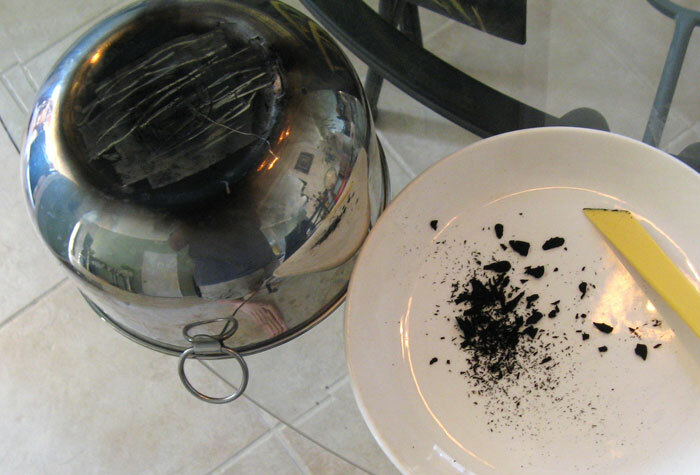 Once it starts to feel a bit on the warm side, blow out the candle, pour the water from the bowl into a garden plant, and simply scrape your black pigment from the bottom of the bowl. 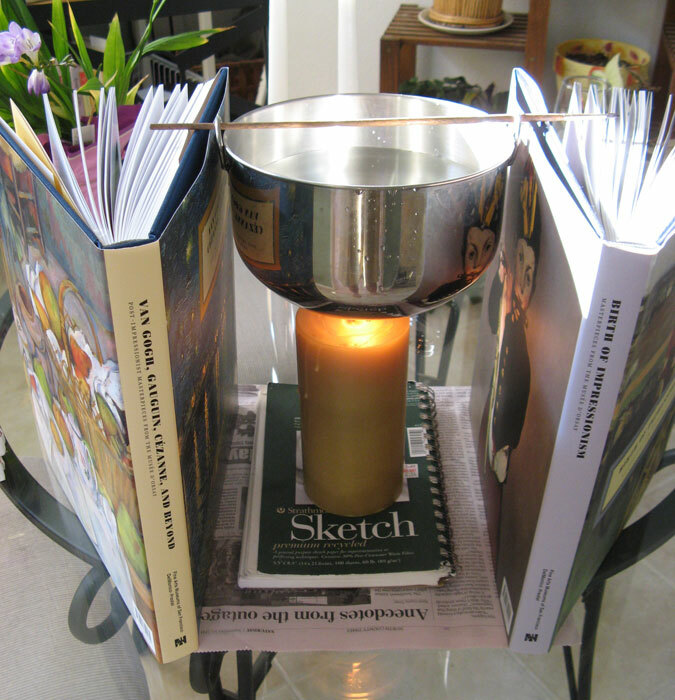 You can keep doing this as long as you wish, of course; you can also periodically move the lit candle around to deposit pigment over a larger area. 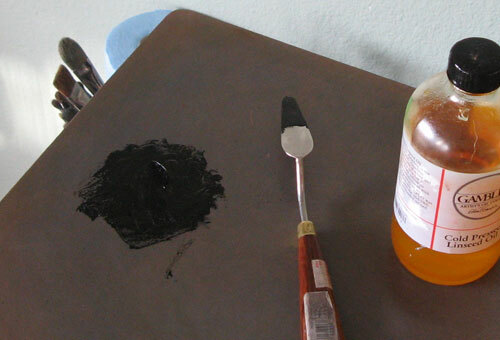 In this image you can see what this candle black pigment looks like in oil. I made a little set of swatches using homemade candle black and lead white from Rublev. Straight candle black in oil is a really rich, inky black, slightly darker even than my bone black from Rublev. Mixed with lead white, it makes fairly neutral grays. If you’re working in oils with candle black, keep in mind the very small particle size of this pigment, likely much smaller even than lake pigment particles. This means that it might lead to premature cracking of your darks if used too thickly on its own. But where this pigment really shines is as an ink or watercolor. With oil, the candle black pigment dispersed very easily with no mulling at all, just a little mixing together with the palette knife right on the palette. In water and gum Arabic, however, the pigment resisted dispersion mightily. I had to resort to mixing in a couple of drops of glycerin, which helped. Nevertheless, once finally dispersed, it made a beautiful ink. In the large image at the top of the post, you can see the drawing I made with this ink. 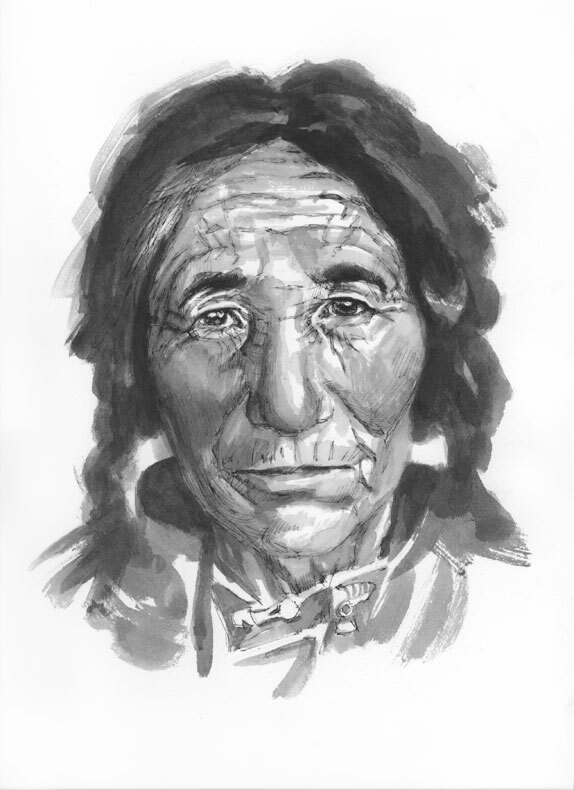 I’ve been trying to figure out a way, in my ink drawings, to mix quill work with brushwork. This represents another attempt to do so. I don’t think I’m there yet; but this one is better than some of the ones I’ve done recently, and I’m happy that my more successful attempt happened with the homemade ink. Candle black is a beautiful color, historic, sustainable, and easy to make. Grab a beeswax candle and give it a try! You are currently browsing the Sunsikell blog archives for September, 2011.